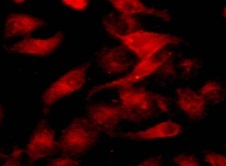 Abbkine Cell Plasma Membrane Staining Kits are a set of fluorescence imaging tools for rapid staining of plasma membranes in living and fixed suspended or attached cells depending on the cell type and experimental conditions. The kit uses a proprietary lipophilic carbocyanine dye (Ex/Em = 484/501 nm) that weakly fluorescent in water but highly fluorescent and quite photostable when incorporated into membranes. Fig. 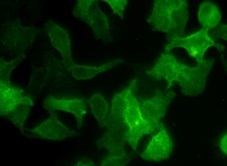 Hela cells stained with TraKine™ Cell Plasma Membrane Staining Kit (Green Fluorescence). • Enables the uniform staining of cell membrane across a wide variety of mammalian cell types, and can be used for both living and fixed suspended or attached cells. • Proprietary CPM Green™ (Ex/Em = 484/501 nm)-resulting in accelerated diffusion within membranes, staining is also maintained after fixation with formaldehyde, enabling further multi-color staining. The cell membrane (plasma membrane) is a thin semi-permeable membrane, consisting of a lipid bilayer with embedded proteins that separates the interior of all cells from the environment. The basic function of the cell membrane is to protect the cell from its surroundings. The cell membrane controls the movement of substances in and out of cells and organelles. In this way, it is selectively permeable to ions and organic molecules. Cell membranes are involved in a variety of cellular processes such as cell adhesion, ion conductivity and cell signaling and serve as the attachment surface for several extracellular structures, including the cell wall, glycocalyx, and intracellular cytoskeleton.